Explosion with truck of Iranian transport company featuring nuclear explosion logo - an act of remote control sabotage? The massive explosion at Iran's top-secret Parchin nuclear facility last Monday remains shrouded in mystery, but new details revealed in an in-depth Channel 10 report by investigative reporter Ronen Solomon who provided the first satellite photos of the site to Israel Defense indicate the blast was in fact a chemical explosion, and may shed light on Iran's nuclear program. 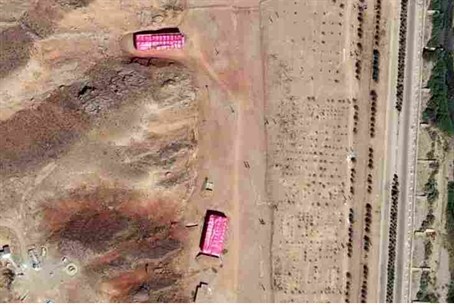 Iran's Defense Industries Organization (DIO) admitted the blast occurred - after Iran initially denied it - saying it was caused as ammunition was being unloaded at the secret military base suspected of being used to test nuclear detonation devices. Despite the claims of an accident, chairman of Iran's national security council Mohammed Saleh has summoned security sources to clarify the cause of the explosion which reportedly killed a "nuclear expert," confirming suspicions it was not a simple accident. The Iranian state-run Fars News Agency on Monday in follow-up reports about the supposed ammunition explosion admitted it happened due to a "private company" that was given a tender to manage the transportation following government privatization. Channel 10 reports that the inquiry apparently is focused on a private transportation company "Hamana," which roughly four years ago was privatized and given given offices adjacent to the Parchin base entrance, where it is authorized to transport dangerous materials in and out of the base. The public relations picture of Hamana features an image of a nuclear explosion, hinting in a not-so-subtle manner that the company may also be involved in transporting radioactive materials as part of Iran's secretive nuclear program. Suspicions that the blast was an act of sabotage by a foreign nation were strengthened by the reports, given that a cyber attack would be possible on Hamana's trucks. Hamana reportedly owns five trucks allowed to enter Parchin, which are equipped with GPS and AVL (Automatic Vehicle Location) systems. The trucks' movements are supervised online, in a system that allows distress signals to be sent out - and even allows remote control over the truck's engine. Satellite images from before and after the blast cut through Iran's initial denials and proved the explosion, showing extensive damage to several buildings and more than one which appears to have completely disappeared. Analyzing the images, Channel 10 reports that the area most heavily hit by explosion damage in the base is a site run by Parchin Chemical Industries (PCI), which is managed by DIO and is subject to UN and US sanctions for producing ammunition and solid propellants for ballistic missile fuel. In fact, the report exposes that four storage buildings in the base were completely wiped out by the blast, and appear to be part of PCI's production and storage workshop for ballistic rocket fuel. It added the building had numerous air vents as characteristic of buildings containing dangerous chemicals such as rocket fuels. A large cement structure adjacent to the center of the blast was left unscathed according to the report, indicating that the explosion was not caused by an accident with explosive ammunition as claimed - which would have caused secondary damage further away - but rather was a chemical explosion. It added that the explosive ammunition on the base appears to be stored in cement reinforced bunkers on the eastern side of the facility, not the area where the blast was centered. It is possible that the chemical storage sites destroyed in the blast also contained radioactive materials left over from the fuse tests conducted secretly at the base as part of a nuclear weapons program - Iran has already admitted to testing exploding bridge wire nuclear detonation devices at Parchin. If so, the report adds that sensors placed by the International Atomic Energy Agency (IAEA) or intelligence services should be able to locate radioactive particulates at the site due to the blast, and thereby obtain concrete evidence of nuclear weapon tests at the facility. On Tuesday the eighth round of Iranian nuclear talks began in Vienna, ahead of a November 24 deadline. A senior diplomatic source in Jerusalem on Monday warned US President Barack Obama is liable to extend the deadline again, and more troubling - he may be holding secret talks with Iran again and making agreements against Israeli interests. Iran has repeatedly threatened to annihilate Israel. Indeed, Obama was revealed last November to have been holding secret talks with Iran for over half a year which led to a temporary agreement, and likewise reportedly had been easing sanctions on Iran for five months ahead of the deal.